Blattberg, Charles. "Canadian Identity". The Canadian Encyclopedia, 27 June 2017, Historica Canada. https://www.thecanadianencyclopedia.ca/en/article/canadian-identity. Accessed 24 April 2019. Canadian provinces and territory flags in Ottawa. In many old countries, the name of the dominant ethnic group is synonymous with the country’s identity – for example Germans in Germany, or French in France. 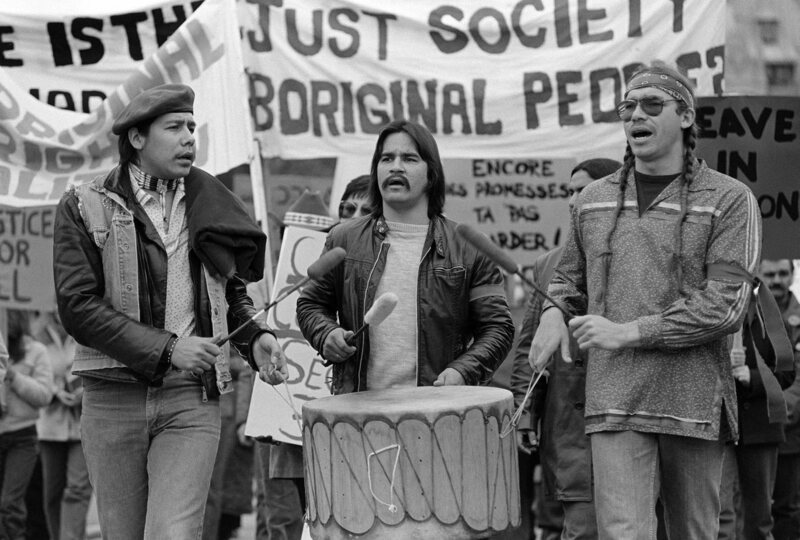 But Canada had numerous First Nations, as well as multiple ethnic settler groups from the start, making it harder to pin down a Canadian identity. The question of what it means to be a Canadian – what moral, political or spiritual positions it entails – has been a vexed one, so much so that some people place the question itself at centre of the identity. The main reason for this is that Canadians have never reached anything close to a consensus on a single, unified conception of the country. According to some interpreters, this is because there are fundamental social divisions preventing the development of such a conception. First, there is the separation between the Aboriginal peoples and the European colonists. Second, there is the separation between the famous "two solitudes," which referred originally to those colonists with either French or British ancestry. Third, extensive immigration since the Second World War has produced a poly-ethnic society that some see as incompatible with a unified idea of the country. As a result, most understandings of Canadian identity have alternated between the extremes of unity and plurality, emphasizing either a vision of "one" Canada or a fragmented nation of "many" Canadas. A more recent, postmodernist view conceives of it as marked by a paradoxical combination of both unity and plurality, together. Another approach moves in between, rather than combining these two extremes, by viewing Canada as a more-or-less cohesive community characterized by what the philosopher Charles Taylor called "deep diversity." The unified conception of Canadian identity has taken various forms throughout history. Often, it depends on which authority is given the final word over matters of profound disagreement. Originally, the two principal competing views were those promoted by monarchists who proclaimed the Crown and the ties with Britain that it represented, and those favoured by mercantilists, as well as those such as the Chateau Clique in Lower Canada and the Family Compact in Upper Canada, who advocated protectionist economic policies in order to facilitate exports. But the Crown eventually lost virtually all of its power and now plays a largely symbolic role in the country. Those that put the economy first share in the belief that Canada is at its best when it is able to provide its citizens with an "efficient society." Populism and the "Just Society"
There have been at least two other contenders for the role of "Canada's unifying idea." One argues that in a democracy, the people have ultimate authority. This view uses the American republican model that inspired the failed Canadian rebellions of 1837, or the various populist movements and parties that have occasionally been influential, such as the Social Credit parties in the west and Québec, and the Co-operative Commonwealth Federation (CCF) and the Reform parties. 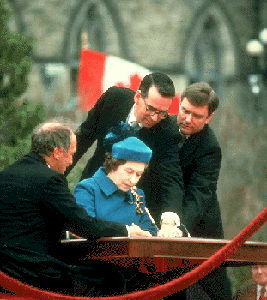 As Prime Minister Pierre Trudeau (left) looks on, Queen Elizabeth II signs Canada's newly patriated constitution -- with the Charter of Rights and Freedoms -- into law, in Ottawa on March 29, 1982. The second is the theory of a "Just Society" that underlies former Prime Minister Pierre Trudeau's conception of the Charter of Rights and Freedoms (1982), which he had inserted into the Constitution during its patriation from Britain. Trudeau's "Dream of One Canada" calls for respecting the individual rights of all Canadians uniformly, which is why he so strongly opposed the failed Meech Lake Accord (1987) that would have recognized Quebec as a "distinct society" and so made way for treating its citizens differently from other Canadians. All of these unifying views link to the idea that literary theorist and critic Northrop Frye called a "garrison mentality," and what the writer Margaret Atwood identified as the "survival" theme present in (mainly English) Canadian literature. It sees plurality – in the form of certain external "others" – as a threat to the integrity of Canadian civilization. These threats include: untamed nature, as symbolized by the harshness of winter or the Aboriginal peoples; the separatist movement of some Québécois nationalists; and the balkanization of the country due to a multicultural policy that some critics believe encourages the development of ethnic ghettos rather than the assimilation of immigrants. This view has led the various defenders of a unified Canadian identity to take a rather belligerent stance towards these supposed threats. The pluralist conception of Canadian identity considers accommodation through good-faith negotiation to be the best way of responding to tensions – national, regional, ethnic, religious and political – that make up Canada. According to this view, the rights contained in the Charter do not form a systematically unified whole, but must be balanced against each other, something which is fully in keeping with Canadian tradition. 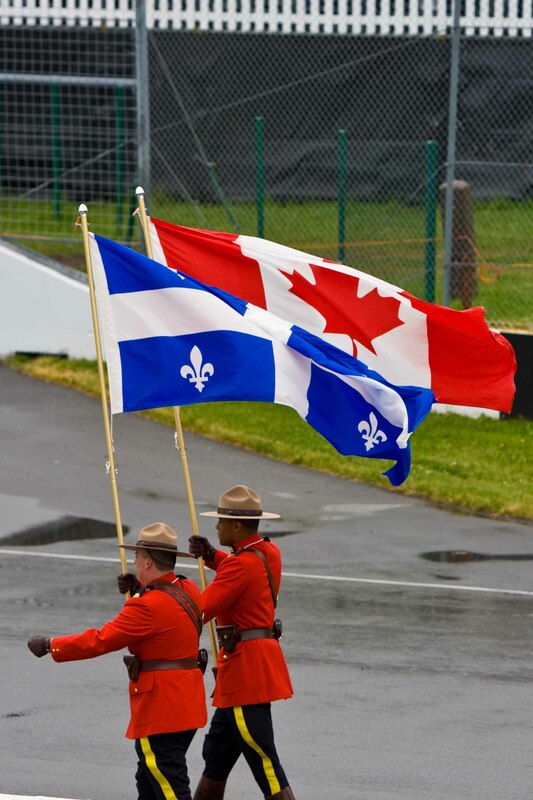 Royal Canadian Mounted Police officers carrying the Canadian and Quebec flags, at the Montreal Grand prix on June 12, 2011. Frye put it this way: "The Canadian genius for compromise is reflected in the existence of Canada itself." John A. Macdonald, the country's first prime minister, praised the resolutions that would become the British North America Act (1867) for bearing "the marks of compromise." Perhaps it is also why, among the submissions to a 1972 CBC radio contest in search of a Canadian equivalent to "as American as apple pie," the winner was neither "as Canadian as maple syrup" nor "as Canadian as hockey" but "as Canadian as possible, under the circumstances." The view of Canada as a deeply diverse community stresses the importance of favouring conversation over negotiation in conflict resolution. This view says that conversation builds toward the common good by focusing on listening and working to a shared understanding. Negotiations rely on rival sides trying to get the best for themselves in the final accommodation. Evidently, this view of Canadians' common good encourages a strictly political, rather than national, conception of the country, one according to which Canada constitutes a "civic" community, a community of citizens, rather than a "nation." National communities are considered largely, cultural entities, those that affirm specific languages as the chief repositories of their artistic productions. Totem poles in Thunderbird Park of Victoria, Canada on August 05, 2011. 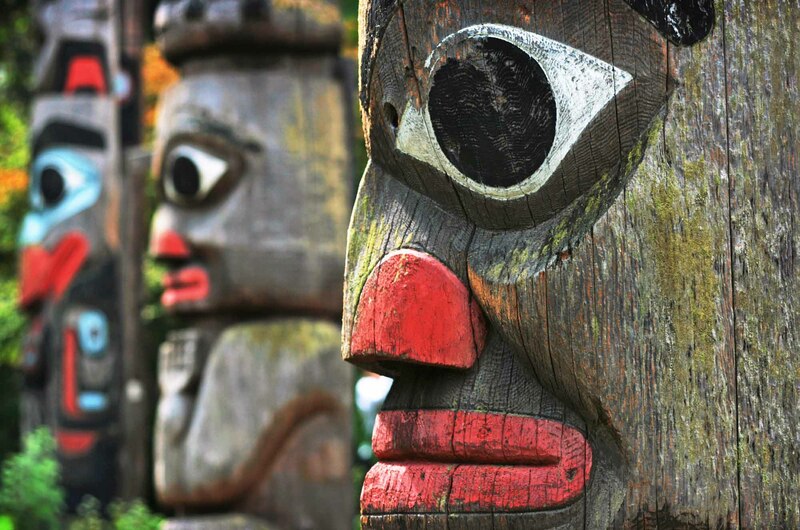 The park is part of the Royal BC Museum Cultural Precinct and home to many First Nations monuments. That said, the civic or political conception of Canada recognizes that the country contains many other kinds of community, including the national. As a result, those who advocate this approach tend to describe Canada as "multinational" or as forming a "nations-state." And though they call on its citizens to try and converse rather than negotiate their conflicts, negotiation is accepted as often unavoidable. Indeed, most Canadians and their representatives are understood to have, for some time now, carried it out in a way largely reflective of small-l liberal ideology. This contrasts with the conservatism that is more dominant in the United States or the democratic socialism typical of the Scandinavian countries. As a result, those Canadian political parties that have wished to form a government have found it necessary to emphasize the more liberal elements of their platforms – even if, in some cases, those elements' liberalism has remained largely implicit. According to this approach, national communities should be distinguished from the civic or political sort, and they should not be equated with ethnic communities. The question is whether the ethnic group wants specific recognition and self-determination from the state or states under whose sovereignty it lives, or if they identify primarily with Canada and seek no specific recognition. Examples of ethnic groups seeking specific self-determination and recognition include Aboriginal peoples, the French-speaking Québécers, the English-speaking Canadians, and perhaps the Acadians. Examples of ethnic groups not seeking such status include the many hyphenated Canadians: Scottish-, Chinese-, African-Canadians, among others. English Canadians are sometimes described as forming a "nation that dares not speak its name," since they tend not to see themselves as constituting a distinct community. Instead, they are often viewed as just one of the two linguistic groups in bilingual Canada. English Canadians have had the luxury of subscribing to this view because as the dominant group in the country, it is all too easy to overlook the distinction between one's national community and the country as a whole. Each of these positions has been well-represented in the debate over the nature of Canadian identity. There is no reason to think that the argument will end any time soon.